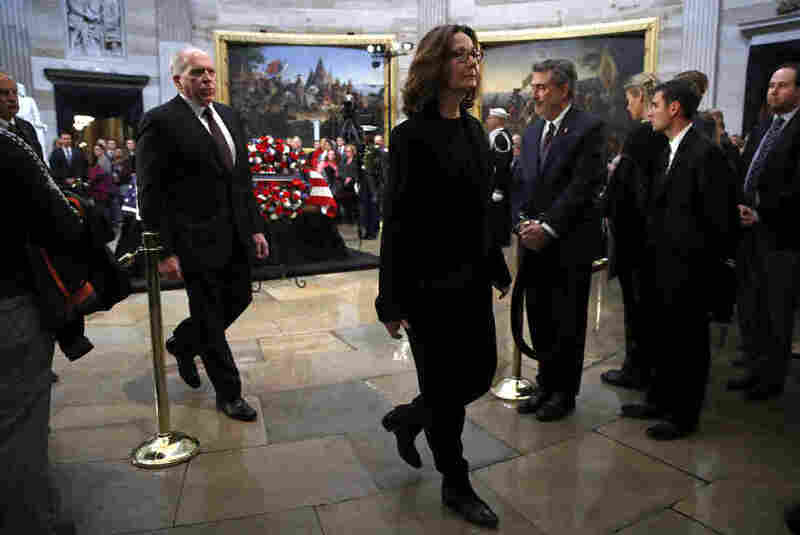 CIA director Gina Haspel (center) departs Capitol Rotunda after visiting the flagged casket of former President George H.W. Bush as he is in the state of Washington. Haspel informs Senate leader on Tuesday what the spy agency knows about the killing of Saudi Arabian journalist Jamal Kashoggi. CIA director Gina Haspel is set to short senate leaders behind closed doors on Tuesday about what the spy agency has discovered about the killing of Saudi journalist Jamal Khashoggi. The CIA has not commented publicly on its assessment of the killing, and Haspel’s testimony is not supposed to be shared beyond the templates in the information room. But many details have leaked. Those who are familiar with the CIA report say that the agency believes that Saudi Arabia’s Crown Prince Mohammad bin Salman was probably linked to the killing. But the evidence is not definitive. Senators received a preview last week from Defense Secretary Jim Mattis and State Secretary Mike Pompeo. Mattis said there was no “smoking cannon” that brought the Saudi crown prince. Pompeo offered similar remarks and said there was no direct reporting that made the link. Several senators were upset that Haspel did not join, which led to Tuesday’s session. Later Lindsey Graham, South Carolina Republic, said last week that he would block other issues before the Senate until he first heard from the CIA about Khashoggi’s death. Khashoggi, who lived close to Washington and contributed to Washington Post was killed after he entered the Saudi consulate in Istanbul, Turkey, October 2. The Saudis have acknowledged that government officials were responsible for killing, but described it as a villain operation and say that the Crown Prince was not involved. President Trump and a number of the last iftare says that the US relationship with Saudi Arabia is critical and should not be completely broken over Khashoggi’s death.